All photos/video in post by Janis Brett Elspas, MommyBlogExpert.com unless indicated otherwise. Sweet Potato & Venison. Sweet Potato & Chicken. Potato & Duck. Turkey Oatmeal Cranberry. Apple & Banana and Peanut Butter & Banana Treats. Organic Barley with Peanut Butter. Meat Enrobed Bones. Spiral Chews. Sounds more like a Five Star restaurant menu doesn't it? But, surprise! These Mr. Chewy delicacies aren't for you animal-loving humans. They're for your beloved dog and the best part -- Daily Oral Care Treats not withstanding -- is they are all really nutritious and healthy for your dog and they taste great too. Not to worry about having to hoof it and shop all over town at multiple gourmet walk-in pet stores and online for all these and many other delectable delights that your four-legged Best Man's or Woman's Friend will appreciate. The best news is that you can buy all the pet treats, bones, and other chewable items personally taste tested by our family pet, Dexter the Miniature Pinscher, and a whole bunch more on a single website called Mr. Chewy. There are currently over 70 items for both dogs and cats to choose from here and the company keeps adding new products often. If your experience is as positive as mine (and Dexter's) was, you'll no doubt find hard-to-find specialty items for your pets by brands that you already may know such as Pedigree, Natural Balance and even Newman's Own Organics among many other companies large and small. Luckily, the Mr. Chewy online store is easy to navigate and is well-organized because there is so much to choose from you'd expect to get overwhelmed by it all. Another point worth mentioning is that there are a variety of products for every size and temperament of dog, so when shopping pick things suitable to your pet's age, weight, breed, and canine-ality. 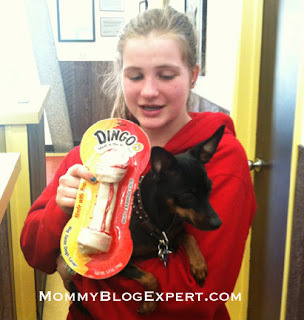 As you can see from this video, our distinguished taster and critic loved the Dingo Bone. The customer service experience -- something that is really important whenever you buy over the Internet -- was way above average with the Mr. Chewy site, too. I literally received a confirming email a minute after I pushed the send button to request the dog treats that facilitated this review. Shortly after that, another message was sent indicating that my box had been shipped. Then several more emails kept me in the loop during transit and even after the package's arrival to make sure everything was satisfactory. Four days later there was a large box of goodies on our doorstep. This company is based in Florida so keep in mind that your order may arrive even faster if you live on the East Coast or in the Midwest rather than in California like I do. Nevertheless, my order was packed and shipped and when it arrived all the contents surpassed my expectations. The ultimate test is when you watch your dog enjoying your purchases. Dexter has already sampled each of the items that Mr. Chewy sent us and loves them all. 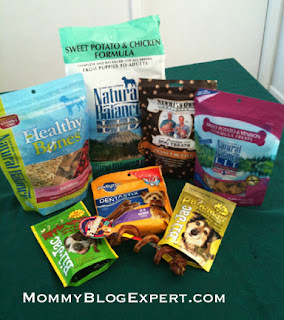 Who better than your dog to confirm quality products like these next? 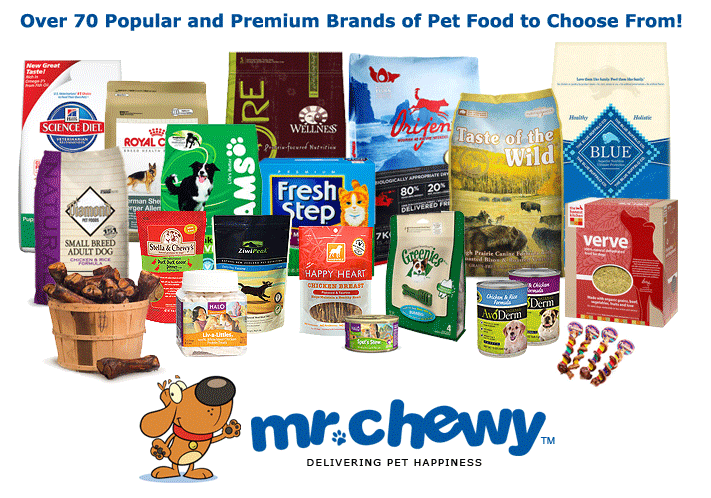 Want to win a Mr. Chewy Gift Card good for your choice of $25 worth of treats for your dog? Just follow the easy directions below. Enter daily to increase your chances of winning. Just leave a comment(s) below this post! Contest ends February 17, 2012 at 12 midnite PST and is open to legal residents of the U.S. only. Winner will be selected at random from all entries and will be notified via email. Simply leave a comment below this blogpost saying why you want to win this prize. Don't forget to include your email address, Facebook and/or Twitter contact info in your first comment so we can contact you if you win. You can earn even MORE chances to win each time you TWEET the message below, up to 3 times each day. Don't forget to return to leave a comment on this post with the direct link right after every Tweet you do so you'll receive an entry for each of your RTs too. FTC Disclosure: This review was made possible by Mom Spark Media. Thoughts are my own. All prizing for MSM giveaways is handled by a third party unless otherwise noted. For this reason prize fulfillment can take up to 90 days after the winners information is received. See additional details on MommyBlogExpert's disclosure policy at the bottom of this and every page on this blog. I'd love to win this for my poodle! I like MBE on FB with my username Mary Happymommy. I like Mr. Chewy on FB with my username Mary Happymommy. I want to win it because I have two cats and one dog. Would love to win it for them. I would like to get some Taste of the Wild dog food and treats. I Follow Mr. Chewy on Twitter as cstironkat. I Like Mr. Chewy on Facebook as Kelly Ann T.
I Like MBE on Facebook as Kelly Ann T.
Thanks for the chance to win would love to give Mr Chewy a try! Oh I would love to win for my new dog I adopted on Halloween. He had been looking for a new forever home for almost 4 months. I fell in love with him at our local petstores adoption days from a local shelter that had rescued him from another state. Poor guy had been thru so much...so glad I found him! We are so happy! Still trying to put back on all the weight he lost in the shelter! So, we could use some treats! I'd like to win because we just found out my kitty is diabetic, and I need to get her some low carb food! I would love to win cause my dog Ruger is due for some new chewy's!! I want to win since I have two pups at home! This would be great for ordering their dog food. Thanks for the chance to win! I'd love to win this for my 2 awesome dog's, Pookie and J.J. Thanks so much for the fantastic giveaway! I subscribe to your email! Thanks so much for the fantastic giveaway! I like you on Facebook as Renee Walters! Thanks so much for the fantastic giveaway! I like Mr. chewy on Facebook as Renee Walters! Thanks so much for the fantastic giveaway! I follow you on Twitter as Renee Walters2! Thanks so much for the fantastic giveaway! I follow Mr. Chewy on Twitter as Renee Walters2! Thanks so much for the fantastic giveaway! This is for our cats. I have six cats, so I am always buying food and treats for them. I would like to win to buy treats for my dog. I'd love to win to treat my cat. I want to win this for our two dogs because they love us and deserve something special! Following Mr. Chewy on Twitter! Liked Mr. Chewy on Facebook! I want to win because good pet food is expensive! Also I'd like to see what it's like to have it delivered. I would love to win, so I could treat my sweet dog with something special.